RIO DE JANEIRO, Jun 18 2012 (IPS) - U.N. 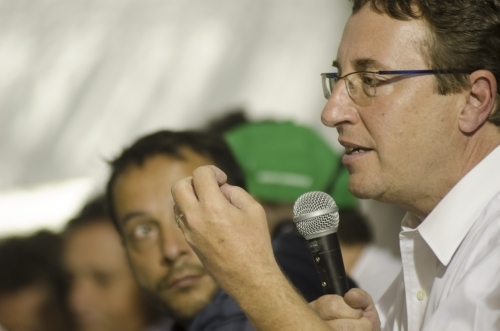 Environment Programme Executive Director Achim Steiner believes that he and the Rio+20 People’s Summit agree that the global economic model has caused the current environmental destruction. But the discussion on what to replace it with turned into an acrid debate. The meeting with Steiner was the most highly anticipated in the People’s Summit: a high-level representative of the U.N. Conference on Sustainable Development – or Rio+20 – came from the other side of this Brazilian city to discuss the green economy with environmentalists and activists. The green economy is conceived of as a major transformation of the current models of production and consumption, aimed at curbing pollution and the exhaustion of natural resources. But social movements say it is just another colour used to disguise capitalism. A green economy is one of the key proposals set forth in the outcome document for Rio+20, which will bring together heads of state from Jun. 20 to 22 – also the last day of the parallel civil society forum, which began Jun. 15. “The People’s Summit is critical of the green economy, because we are the people who have suffered the crisis of capitalism and of that model of production which, the worse things get, the more it undermines our rights,” said Brazilian activist Fátima Mello, one of the organisers of the parallel meeting. “We see the green economy, which is based on the commodification of natural resources, as closely linked to a brown economy” of pollution and destruction, said another Brazilian activist, Larissa Packer, with the NGO Terra de Direitos (Land of Rights). “The true green economy is not the green dollar, as our leaders see it. It is our green Amazon jungle,” said Bolivian indigenous activist Edwin Vásquez, who accused transnational corporations of invading the rainforest and plundering natural resources. He told the people at the debate that the current model “has not been the great breakthrough,” and that “certainly we in the United Nations Environment Programme are deeply, deeply, deeply troubled by the way the world is moving at the moment.” He also urged the participants to read UNEP’s official document, which addresses the different interpretations of the green economy. And he used almost the same words as his listeners when he criticised the market’s capacity to achieve sustainable development and said the market would not help run the planet in a sustainable fashion. But the differences arose when it came to the search for options to the current economic model. He said that “the idea is not, by attaching a value (to the Amazon jungle) to then transact in the market place…in fact I would argue that….maybe the opposite would happen: we would actually issue laws to protect nature, we would increase protected areas, we would have far more indigenous peoples managed lands and reserves and we would have laws and criteria for the private sector and business to conduct business in a way that is not destructive. “So the automatic logic that if you look at value, if you look at what is happening to our planet through the lens of economic analysis that you automatically end up with a capitalistic (system) is not one that we stand for, it is not one that we have written about, and it is not one that I hope you will automatically equate with this debate,” he added. He also referred to good and possible technologies such as clean, renewable energies, which he said would not generate unemployment but would provide more jobs than the automotive industry. However, his arguments did not convince biodiversity expert Pat Mooney. The Canadian activist cited harmful technologies proposed as part of the green economy, such as synthetic biology – the design and construction of new biological functions and systems not found in nature – or transgenic crops, which have given a handful of multinationals control over most global seed sales. Mooney said he was appalled by a green economy that was seeking to control the planet’s biomass. “Underlying that concept is the assumption that nature is capital,” said Solón. Steiner “says that they are trying to decouple growth and environmental destruction. It is not possible to grow forever, biodiversity is the limit! What we need is to redistribute wealth!” he said vehemently during the debate – to which the UNEP head retorted that raising his voice did not make Solón right. The world will not move forward in the midst of the polarisation between capitalism and anti-capitalism, Steiner said, before noting how difficult it is to achieve a consensus among U.N. member states. The debate left a bitter taste in the mouth of many of those present. The creation of a green economy without regulating the financial market would cause the opposite of conservation: “an unpredictable financial bubble,” Packer told TerraViva. “When a commodity is scarce, its value goes up. That means that the more nature is destroyed, the higher the value of natural resources will be,” she warned. *This story was originally published by TerraViva.